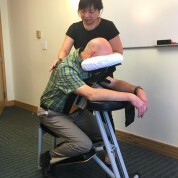 Back by popular demand, Parkin’s social committee hosted a massage clinic for employees. After their massage, employees felt rejuvenated, relaxed and energized. It was appreciated after weeks of tight deadlines.